en español | This blog was co-authored by Environmental Defense Fund’s Amazon Basin Project Coordinator Chris Meyer and McGill University professor and Smithsonian Tropical Research Institute’s Research Associate Dr. Catherine Potvin. Deforestation accounts for as much as 15% of all manmade global warming pollution, and negotiators from countries around the world have been working to hammer out policies at United Nations climate talks to reduce emissions from deforestation. It’s easy to get lost in the details of the complex policies of reducing emissions from deforestation and forest degradation (REDD+), and miss what’s happening — and who’s working — on the ground. So, just prior to the UN climate negotiations in Panama City earlier this month, Environmental Defense Fund’s Chris Meyer and McGill University and Smithsonian’s Dr. Catherine Potvin organized a field trip for UN negotiators to see first-hand the realities of deforestation, and of the policies that have been put in place to protect forests. For their first stop, REDD+ negotiators from Canada, Denmark, the European Union, France, Italy, Mexico, Norway, Peru, the United States, and a member of Panama’s government’s REDD+ team visited a REDD+ project in eastern Panama. The 500 indigenous people who live in Ipeti-Embera control approximately 3,200 hectares (7,910 acres) of land. In the eastern part of Panama, including the provinces of Panama and Darien, where the community is located, huge swathes of primary forest, rich in biodiversity, have been cleared for timber and cattle ranching by migrant farmers coming from Panama’s central Provinces. Indigenous People mostly try to withstand invasion from these migrants, as they value the forest more than pastures. The REDD+ project seeks to find a solution to such land conflicts and deforestation. 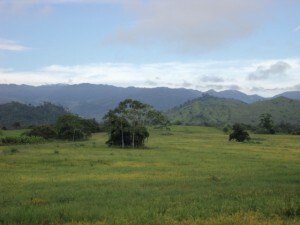 This picture shows the benefits of having indigenous communities control forests; the indigenous-owned lands of Ipeti-Embera on the left remain heavily forested, while the hill to the right has been cleared of its forests and converted to cattle pasture. In 2007, the Smithsonian Tropical Research Institute (STRI) decided to move towards carbon neutrality. As part of its strategy to offset its carbon footprint, STRI became interested in piloting a REDD+ project with the Ipeti-Embera community. Twenty-one families in Ipeti-Embera now have small reforestation parcels of native species that are sequestering carbon while 48 households are ready to modify their pattern of land use to reduce deforestation and forest degradation. STRI is purchasing the sequestered carbon, or carbon offsets, while analyzing the barriers to implementation of similar projects elsewhere. The revenue from the offset sales to STRI is a welcomed extra income for the families. After a delicious customary lunch served in banana leaves, the group headed to the community of Nuevo Paraíso, or New Paradise. Founded about 25 years ago, Nuevo Paraíso is a migrant farmers community whose families own 25-50 hectares of land and practice a mix of subsistence agriculture and small-scale cattle ranching on deforested land. In this field trip, negotiators were able to see REDD+ projects that work with communities and farmers to prevent further deforestation and maximize the benefits of forest protection. 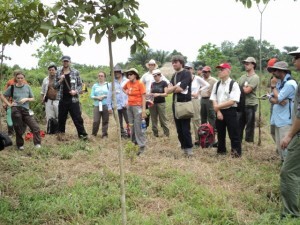 This was a truly eye-opening experience for negotiators, seeing how well policies to avoid deforestation work. Negotiators told us they enjoyed the opportunity to spend time on the ground in the rainforest, and some even mentioned this was their first time in the forest and first contact with communities trying to halt deforestation. In Ipeti-Embera, negotiators had time to speak with community leaders and participants in the REDD+ project, and witness first-hand the complex challenges of implementation. In Nuevo Paraíso, discussion centered on how the private sector could be successfully engaged in REDD+ activities, and provide much-needed financing. Financing options for REDD+, including carbon markets, are on the official agenda for the upcoming UN climate talks in Durban, South Africa, at the end of this year. These negotiators now are able to take back with them to Durban and later international climate talks the on-the-ground knowledge they have about the REDD+ projects, including that REDD+ policies work, and local communities are critical to implementing — and simultaneously benefitting — from them.